We may well be coming back to Washington state again. We have 52 weeks in the year (as do most of you) and 50 states to visit, so even with one week in Washington, D.C., we still have a week to spare. It could be that the minivan could say “no mas” or one of us could be hospitalized with a case of the Mondays and throw off our schedule. But as of now, we plan to use that extra week back in Washington state. If that’s so, I’ll be writing about WA films again in December, and thankfully, this is a film rich state. So I’ll split things -- I’ll do Washington dramas now, and plan to do comedies (chiefly romantic comedies) in December (so you fans of Tom Hanks, Meg Ryan and Cameron Crowe will just have to wait). David Mamet is widely considered one of America’s greatest playwrights, but back in 1987 he became a film director as well. 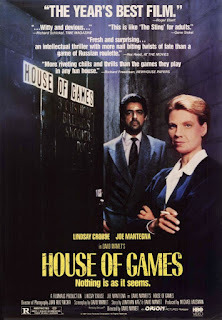 House of Games is about a psychiatrist (played by Mamet’s then wife, Lindsay Crouse) who investigates the world of con artists. We watched this film at my daughter’s apartment using the local library video app chromecasted to her TV (#weirdworld). 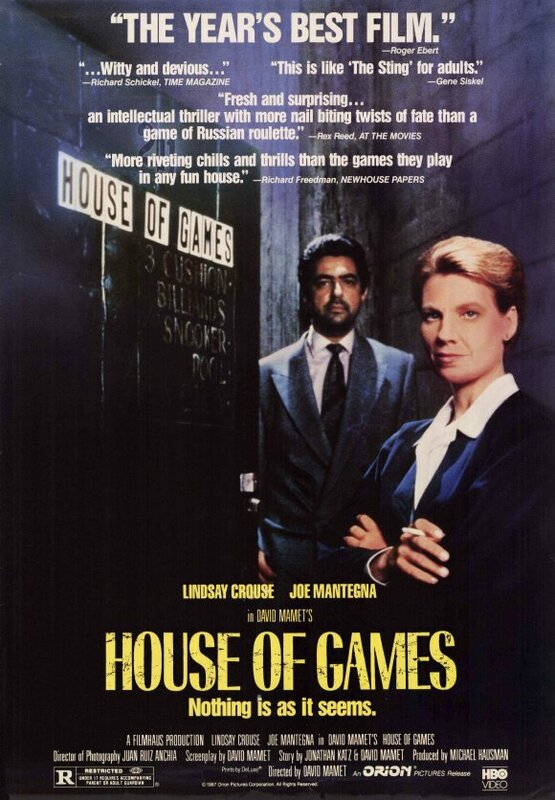 Joe Mantegna as Mike, the lead con, explains that the confidence game is about giving people confidence. Ill placed confidence, sometimes especially confidence in one’s self, leads to trouble. There are no churches in the film, but the doctrine of original sin is well supported. The film is set in Seattle and was filmed in the city. Sin and social ills are darker still in The Accused, in which Jodie Foster plays a woman who is raped in a bar. Because of the character’s trampy reputation, no one believes her. Foster won an Oscar for the film which, though set in Washington, was filmed in Canada. Another Oscar winner was Lou Gossett Jr. for his role as a drill sergeant in An Officer and a Gentleman. The film is supposed to place take at Naval Flight School in Pensacola, FL, but the Navy was not thrilled with the way the program was depicted in the film, so it was filmed in Washington state. I can’t imagine the Army was too excited with First Blood, the first Rambo film in which Sylvester Stallone played a soldier who returned from Vietnam as a guy who just wanted to mind his own business but when pressed becomes a killing machine. Though set in Washington state, it was filmed in Canada. Also set in Washington but filmed in Canada was Robert Altman’s 1971 classic western, McCabe and Mrs. Miller. Though it’s a film about brothels and gunslingers, the film does have one aspect that fits nicely into this blog: it’s set in the town of Presbyterian Church, WA. Two well regarded horror films, 1980’s The Changeling (a ghost story with George C. Scott) and 2002’s The Ring (a cursed videotape story with Naomi Watts) were both set and filmed in Washington. Of course, even scarier than ghosts is world wide thermonuclear war, which just about breaks out in 1983’s WarGames. The scary concept of computers that can reach outside of the home into the world is the basis of the film. But such things can’t really happen, can they Matthew Broderick? That film, too, is set and was filmed in Washington state. The Twilight films were set and filmed in Washington state. But I can’t decide if those films are dramas or comedies, so they won’t make either list.